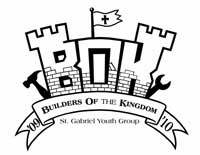 High School Youth Group "BOK"
BOK stands for Builders of the Kingdom and it's the name of the St. Gabriel High School (grades 9-12) Youth Group. The goal of BOK is to help young people grow closer to Christ through social, spiritual and service events. BOK is a great way for you to stay in touch with old friends who attend different schools as well as meet new friends. Now accepting applications for camp counselors!